The weather in the first two months of 1950 was awful statewide. January was an extremely cold month and featured frequent snowstorms and some of the heaviest one-day snow falls ever recorded. 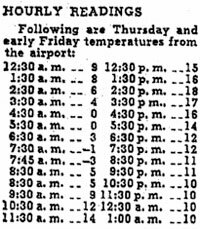 At 7:45am on Thursday, February 2, 1950 the temperature dropped to -3 degrees Fahrenheit at the Portland Airport, the all time record low for Portland. Think that’s cold? The Eastern Oregon town of Seneca got down to -40 on that day, Chemult -30, and Pendleton recorded -25. The previous Portland record of -2 had endured since 1888 (the temperature reading then had been taken on the top of the Kamm building at SW 1st and Pine).